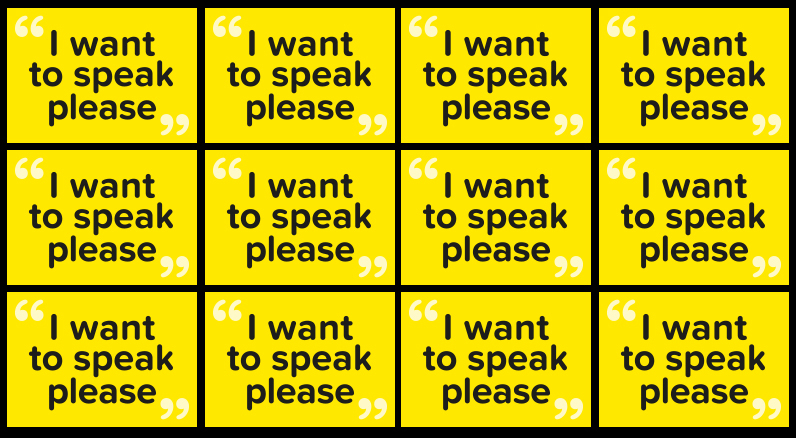 They would have loved our yellow “I want to speak please” cards! a visual aid to help people feel confident to take the next turn to speak (“or else my thoughts fly away”). a way of slowing meetings down, with people instinctively speaking one at a time. a way of creating space for people to find their voices (“holding my yellow card makes me feel it’s OK to take my time”). a way of helping everyone to feel more equal in a meeting – to feel that you have the right to speak in the way that suits you. It’s important that everyone uses the cards in meetings, not just people with dementia. The cards are intentionally eye catching – and therefore hard to ignore. The yellow of sunshine, hope and optimism. They are handbag and notebook size and easy to carry around. And they are not really about speaking – but about being heard. A member of the DEEP network in the North West, spent a meeting handling his yellow card. He was a quiet man who had not so far contributed to the meetings. He spent a lot of time looking at his yellow card, turning it around in his hands, exploring the texture and feel. He then started to read out the words: “I want to speak please. I want to speak please. I want to speak please.” This was the first time that anyone had heard his voice in the meetings. His peers were delighted – it was an act of communication that connected him and them in that moment in time…. We are always happy to send out a number of cards for your meetings and gatherings with people with dementia. Please contact kate@myid.org.uk if you would like to order any. And do send us your photos of them in use! You can tag us at @Innov_Dementia on Twitter.